Australian deathcore act Thy Art Is Murder came through Lawrence, Kansas on Monday, April 18, 2016 at the Granada Theater as part of their Coffin Dragger tour. Featuring four heavy, similar, but still noticeably different acts, the night was a showcase of metal in its many forms. Opening band Dark Sermon combined sludgy, doom-laden riffs with vocals fitting between traditional metalcore and more of a black metal, European approach. Their stage antics were entertaining – at one point frontman Johnny Crowder tied a pentagram-decorated scarf over his face and performed blind – and the riffs were catchy even though they were dark and heavy. It’s important to note how tight the band were live: the riffs flowed a little more organically into each other than the more technical bands later in the evening, and the instruments were locked into a perfect groove. Dark Sermon are the rare death metal band who could cross over and appeal to a broader audience. I could easily see them opening a bill with Mastodon, Black Label Society, or even Alice In Chains, even though they are heavier than any of those acts. Following them was Fit For An Autopsy. 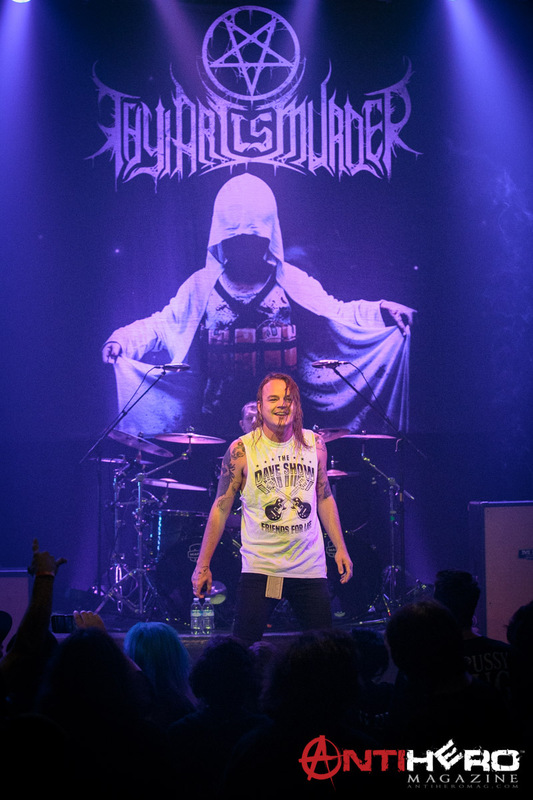 Basically a faster version of Thy Art Is Murder, Fit For An Autopsy‘s key member was drummer Josean Orta, who demonstrated remarkable skill not only with his double-bass speed, but also the complex rhythms that mutated through each song. Hands down one of the best drummers I have ever seen perform. The last supporting act was Rings Of Saturn. Rings Of Saturn were certainly tight, but while the songs displayed an incredible level of talent, they missed the mark as far as actually being musical. Aside from a few passages, most of their set was atonal and abrasive. Then came time for Thy Art Is Murder. I had seen them a couple times before, but this is Thy Art Is Murder‘s first tour without vocalist CJ McMahon, who suddenly and unexpectedly quit the band late last year because they weren’t making enough money for him to raise a family. 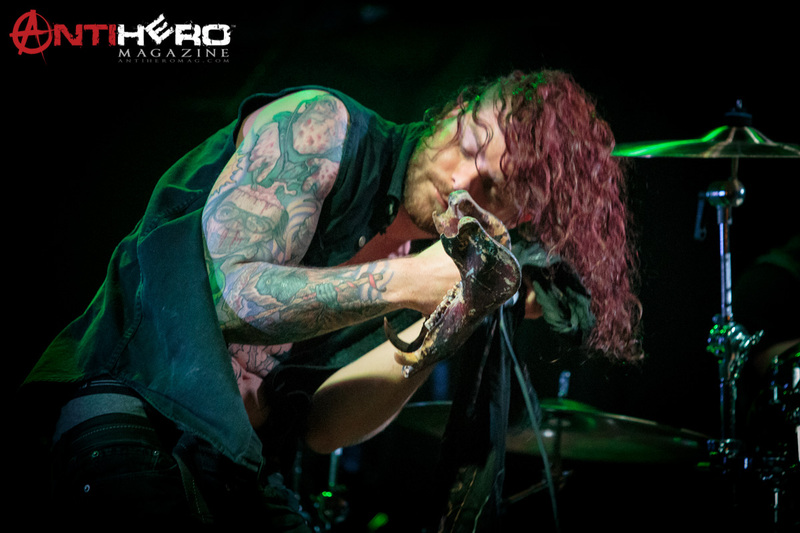 In what may be a temporary OR permanent arrangement, for this tour the band tapped frontman Lochlan Watt, a radio DJ from near their hometown who fronts a band they had toured with previously. And judging from this show, Thy Art Is Murder could really make the decision either way. Watt has commanding stage presence, is a down-to-earth, engaging frontman, has impressive range, and fits the band’s style perfectly. There are actually quite a few bands who would do well to replace their existing vocalist with Lochlan Watt… but I don’t think Thy Art Is Murder is one of them. CJ McMahon is still the best live deathcore vocalist I have ever seen, able to effortlessly switch between almost a dozen different styles of scream (including the lowest gutturals snarls I’ve ever heard), and the band as a whole seemed diminished without him. The guitars sounded flatter, the beats sounded slower, and the overall energy wasn’t as intense; somewhat ironic considering Watt moves around on stage far more than McMahon, but still true. None of this is to say Thy Art Is Murder are not still one of the best bands in the genre. They were still worthy of being the headliner on this bill – although Dark Sermon may catch them soon – and their crowd is still wild. If this were my first time witnessing them, I would have been more impressed. I just feel like they need to wait if necessary and find a singer who can match McMahon’s phenomenal range before recording or touring again. If this tour is coming near you, it is certainly worth the fairly low ticket price. Just know that if you’ve seen them before, it may not be quite the same band you remember. Check out the full gallery from the Coffin Dragger Tour here!